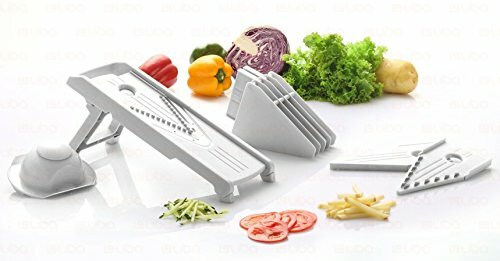 ✅ SAVES YOU TIME: This hand-held mandoline slicer will cut your prep time in half, by cutting through potatoes, onions, cheese and vegetables with ease. 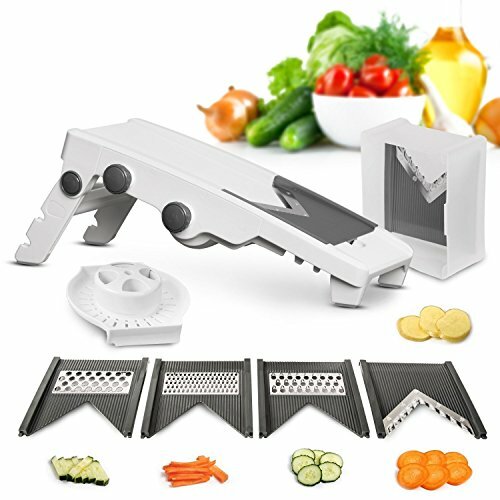 ✅ VERSATILE KITCHEN TOOL: Use it for all kinds of veggies and food, like carrots, tomato and cucumber and make delicious salads within a few minutes. 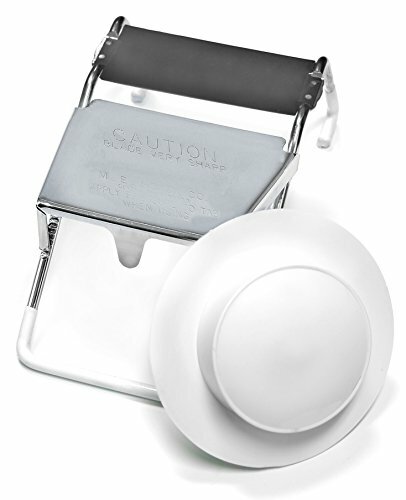 ✅ CONVENIENT FOOD CONTAINER BASE: You can now cut on the mess thanks to the food container holder base that catches all your slices, shreds and cuts. 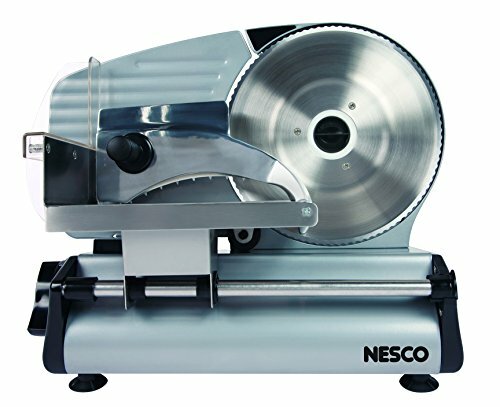 SAFEST SLICER ON THE MARKET: Built using Food-Safe ABS plastics to keep your food clean & chemical free, Slip-Resistant Rubber Footing to prevent slippage accidents, and finger saving Slice guards all in one slicer! CUTS PREP TIME IN HALF: Perfectly julienne whole carrots in 3 seconds or less. Paper thin potato slices for homemade potato chips? Under 2 seconds. Welcome to the 21st century of cooking. 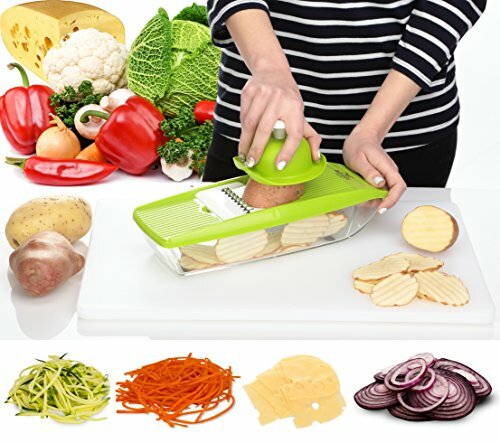 ✔ SLICE, JULIENNE & WAFFLE ALL YOUR VEGGIES: Enjoy picture-perfect tomato, cucumber or onion slices, julienne vegetable strips, waffled potato chips or grated cheese in just minutes! 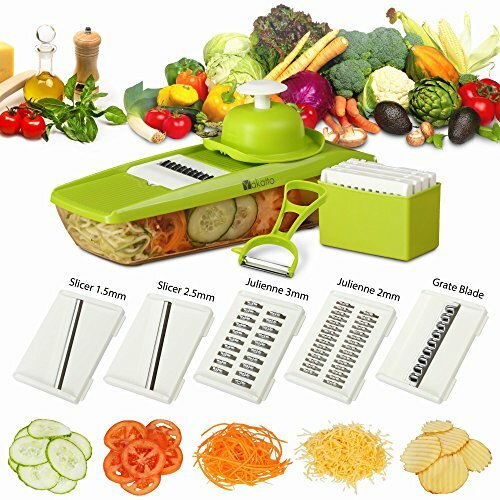 Space saving and dishwasher safe, this mandolin food slicer / vegetable cutter / food chopper is a must have for every health conscious individual! 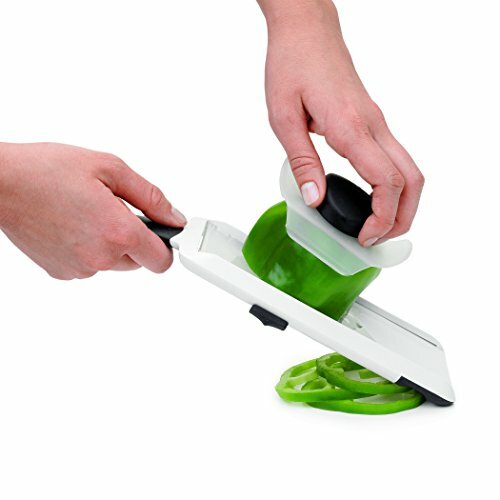 ✔ KEEP YOUR FINGERS SAFE: Featuring a safe finger guard that securely grips on the veggies to protect your hands from accidental cuts, this mandolin will let you cut your vegetables to perfection effortlessly! 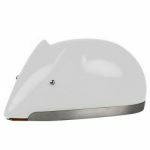 ✔ EASY TO CLEAN AND STORE: Wash the slicer with warm soapy water and it is ready for another use. After drying, it is ready to safely be stored as all blades and hand guard fit in the container. RELIABLE: Built from BPA-Free ABS Plastic and Heat-Treated Stainless Steel. Two High Class Japanese Razor Sharp Blades, guaranteed not to rust or loose sharpness qualities in time. Built-In Finger Guard Protection And Safety Cap. | CONVENIENT & USER FRIENDLY: Comes assembled and ready to use. 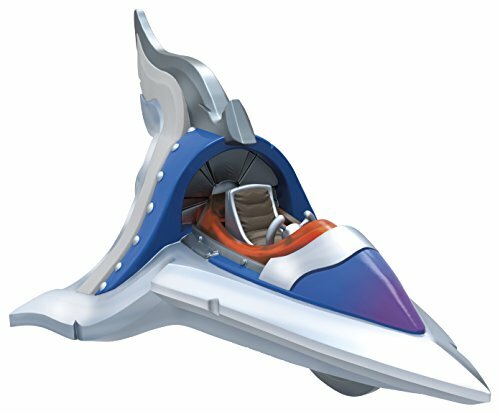 Super-easy to use ! 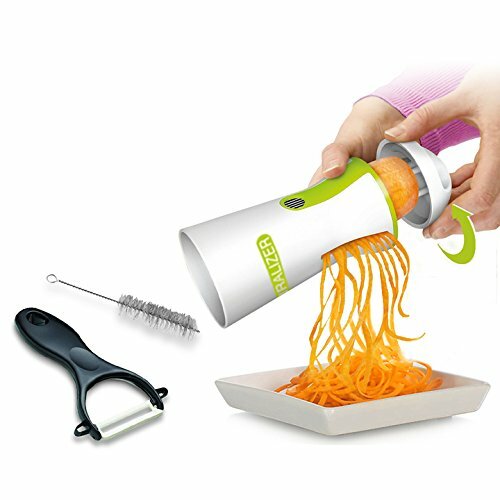 VERSATILE: Create NOODLES and JULIENNE SPIRALS from a great variety of vegetables: Carrots, Zucchini, Cucumbers, Squash, Radish, Sweet And Regular Potatoes, and lots others. 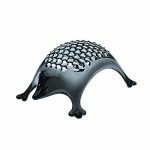 2 Julienne Sizes (1/16″ x 3/32″ and 1/8″ x 3/16″) – Fits easily into any kitchen drawer – User friendly and Ergonomic Design! SUPERIOR QUALITY & VALUE for the Complete Spiralizer Bundle: The Spiralizer® Slicer + Ceramic Peeler + Flexible Cleaning Brush. Works better than expensive models! Most often featured as a favorite and recommended as the best by publications and networks, including Bon Appétit, Food and Wine, House Beautiful, Oprah Magazine and Food Network. 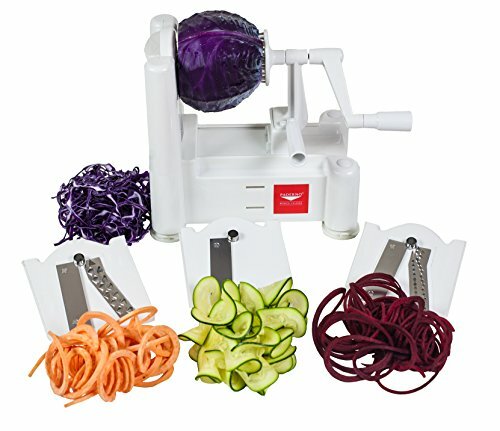 ENDLESS VEGGIE & FRUIT CREATIONS – Make professional looking garnishes in mere seconds; create zucchini noodles, curly fries, cucumber ribbon strands, onion rings, apple strands and much more in a matter of seconds. Get your family to eat more vegetables and fruits with these exciting designs. Use with a variety of firm vegetables and fruits including zucchini, cucumbers, potatoes, carrots, apples and much more. FOLDABLE & COMPACT – Easy to setup and easy to fold away. 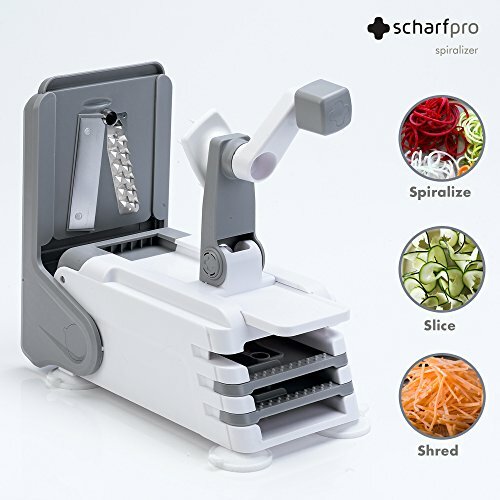 The ScharfPro™ Foldable Spiralizer simply clicks open when ready to use, and when done folds down flat to a compact size of just four inches high; enabling the entire unit to be placed in a small drawer or cabinet for amazingly compact storage. 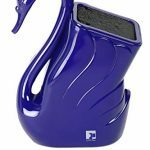 Its compact size makes it also very practical to take along on vacation, camping, etc. 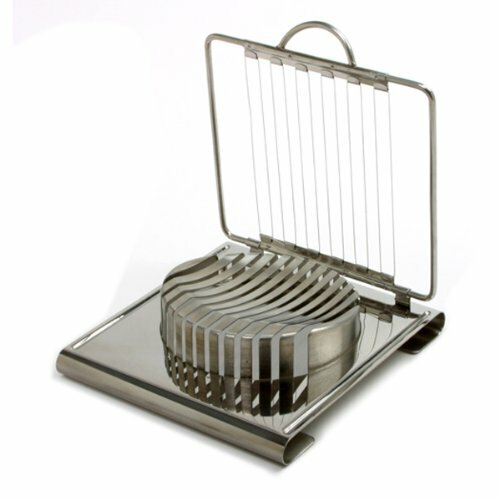 Features a practical storage compartment; store all three blades and other parts inside the spiralizer. HIGH QUALITY & SUPER-STURDY – Constructed with extra heavy-duty reinforced break-resistant plastic and stainless steel. Engineered and manufactured according to the highest standards of performance. Guaranteed to last and to provide many years of frustration free and hassle free vegetable spiralizing. Enjoy the quality!